In “No Way Out,” episode nine of The Walking Dead’s sixth season, the motley band of survivors covers itself in zombie intestines, links hands, and walks among the dead. By donning gut-soaked ponchos, the group is able to mask the smell that comes with living and blend in with the walker horde. But when Sam, a young boy, freezes and whimpers in terror, the walkers descend on him. They tear him apart, as they do his mother when she cries out in shocked grief. The pair dies because it fails to hide. Hiding is everything in the post-apocalyptic America of The Walking Dead. Whether behind walls or beneath blood-stained smocks, humans survive only when they are able to remain unnoticed—by both walkers and other humans. The walkers hide, too; in forests, cars, and seemingly abandoned buildings. They dally aimlessly until a gunshot or a slammed door summons them. Then they move in unthinking, overwhelming numbers, and they kill. Because it highlights the horror inherent in the ability of things to hide in plain sight, The Walking Dead’s dystopia is especially apt for the Trump era. There are always forces just below the surface—just beyond the gates and the polls—that threaten the continued survival of life as we know it. Be they zombies and traitors, or phenomena like racism and misogyny. Sure, it’s never a total surprise that there are walkers in the warehouse, or that racism still exists in America. But the slightest degree of surprise is what maintains the disappearing normality of “before.” “After” is the new normal, when the once-unimaginable is tolerated; when the discovery of walkers in the woods or bigots in the White House ceases to surprise. Normalization does not occur on its own, however: allowing it to happen, through either action or inaction, is a choice. But in The Walking Dead, given the nature of the apocalypse, resisting the normalization of brutality is difficult. When Rick’s group votes on courses of action, the violent option becomes easier and easier to vote for with each successive referendum—because it tends to work. Lurking under the democratic sheen of Rick’s meetings, then, is the fact that the freedom to choose erodes with every passing moment of the apocalypse. Maggie hints at this in “The Same Boat,” when she explains her pregnancy by saying, “I’m choosing something.” In a world torn to pieces, the only choices left are those intimately tied to increasingly fragile bodies. The choice to spare or rend or die, to give life or take it. In comparison to the choices that Maggie must make, choosing between Clinton and Trump should have been easy. But Trump won, and campaign promises don’t magically vanish upon election or the deletion of a tweet. So now middle-schoolers are chanting “build the wall”; spray-painted swastikas are emblazoned on parks and college campuses; a student at the University of Oklahoma added black UPenn freshmen to a GroupMe in which racial slurs and references to lynching abounded; and hate crimes more broadly are proliferating. With vast populations in actual danger, there are growing and legitimate fears about the direction in which America is heading. Yes, the nation is in turmoil—but surely what Americans are experiencing is less frightening than what The Walking Dead depicts. Zombie outbreaks remain in the realm of fiction, and civilization continues to exist. Some are even more optimistic, and see in Trump’s election an opportunity to push the mainstream progressive movement further to the left. If they’re right, what feels apocalyptic could catalyze genuine socioeconomic reform. The Walking Dead shares the belief that crisis has the potential to advance progressive politics. It is telling that a great deal of the show’s couples are interracial, and that homosexuality meets little if any resistance—despite the fact that much of the show takes place in the Deep South. Because as the state dissolves, many of its foundations—such as racist and sexist hierarchies—fall with it. (Classism, on the other hand, is an entirely different story. Life after the apocalypse, with its scarcity of guns, food, and supplies, is exceptionally materialistic.) So while the apocalypse does not eradicate all oppressive social structures, it does significantly moderate many of them. The apocalypse’s erasure of historical baggage is also reflected in The Walking Dead’s treatment of American geographical symbolism. The northward migration of the show’s protagonists initially evokes the legacy of slavery: the South recalls old wounds—it is where Rick wakes up in a hospital to a world in flames—while the North promises a clean slate. But the fact that Rick and his friends find continued tragedy on their travels makes clear that cut-and-dry geographical symbolism is naively simplistic. There is no shortage of walkers, nor of people willing to kill other people, anywhere in the country. Even the faux-utopian city of Alexandria, on the outskirts of Washington, DC, almost crumbles as walkers breach its walls. On Election Day, the real Alexandria mirrored the one in The Walking Dead. The left-leaning city voted for Clinton as the threat of a Trump victory in Virginia gained momentum. It was a blue dot on a map teeming with red; a scarred dream staring at an unheralded sea of walkers. But there is a crucial difference between walkers and Trump supporters: the latter are living, breathing people. They think. That is precisely why their willingness to compromise American lives and values is inexcusable. They have, either passively or actively, declared that a platform to which white nationalists have flocked is an acceptable means to a self-serving end. The argument that the much-discussed “white working class” seeks only to better its precarious economic status misses the point. To be blindly and destructively single-minded is to forsake humanity for a walker’s fate. Now Trump’s followers, along with the rest of America, are ambling toward a reckoning. 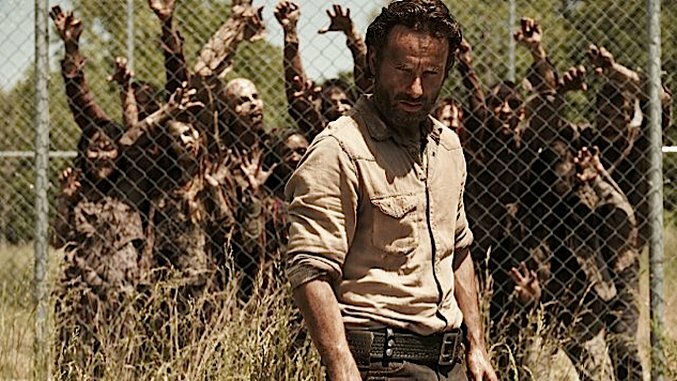 In the twilight leading to a Trump presidency, the prospect of fighting against zombies has become a relatively tame one. True horror, instead, lies in the possibility that we are collectively zombifying; that the darkness unshrouded over the course of the election—and validated by its results—could decompose what little connective tissue society has amassed. Everyone wants to identify as Rick, or Michonne, or another survivor, complex and battered but clinging to life. Maybe we are, in our own ways, reminiscent of the stragglers piecing together what the world means now. Or maybe we’re all fibers of a single walker, ebbing, withering reminders of a time now past. Niv M. Sultan is a writer based in Washington, DC. He’s into culture, politics, and history. You can follow him on Twitter and check out his website.